It’s a sad day in Corenwald when no one believes in feechies anymore. Specifically, it’s a sad day for Floyd Wendellson and his boy, Grady. The paying crowds pay them no longer. After making a living for years by pretending to be a feechie expert and a genuine feechie boy, they may have to get legitimate jobs. Ha ha! I’m kidding, of course. What they do next is put up the Ugliest Boy in the World act. As the bad new days run on into years, they make a daring bid to bring back the good old days. Their scheme is unethical and there has to be some sort of law against it, but what do you expect from the charlatan and his boy? They’re neither heroes nor villains, only two showmen trying to turn a pretty penny without any punctilious dedication to the truth. Jonathan Rogers delivers his story in appropriate style. The book is filled with humor, much of it the sort that is seen by the readers and not the characters. It’s written in first-person, and as you can imagine, a charlatan’s boy will not have the most educated voice. Though to be fair, almost no one in the book does. The editor either had a hard or wonderfully easy time of it, depending on whether she tried to distinguish real grammar errors from style or simply decided it was all one. Among the rough-and-tumble sorts, constables in blue uniforms and schoolmarms in one-room schoolhouses impose civilization. Yet two things break the mien of the nineteenth-century frontier verging into civilization. For one, the weaponry is bows and arrows, swords and spears. For the other, the good people of Corenwald were seriously told by their forebears that another race lives secretly alongside them, and they are not too far away from believing it. The Charlatan’s Boy is reminiscent of the old-school episodic novel – Little Women, Anne of Green Gables, Penrod, Mark Twain. The main issues of the book are set up at the beginning and steadily – if not urgently – addressed. Yet, lingering over drovers’ fires and doing the phrenology routine, even parts that advance the plot often feel anecdotal. The anecdotes were entertaining, well-told, and even charming. But as they followed one on another, I began wondering when the next shoe would finally fall on somebody. I would, however, do a disservice to this book if I made it sound as if it went nowhere. It did go somewhere, and the climax and conclusion were marvelous. The humor and the lightheartedness of the story are a joy, and sometimes – suddenly but naturally – sadness pierces through, straight to the heart. 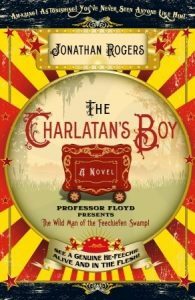 The Charlatan’s Boy, with its humor and its heart and its style, is captivating and even, in an unemphatic sort of way, brilliant fantasy.